You do not need to register the Free Edition of ROBOTILL. If you want to use the Free Edition, simply click on 'No' when asked if you want to upgrade and you can continue to use the free edition for as long as you want. If you want to upgrade to the Full Edition of ROBOTILL, you can purchase a license here. You purchase a licence for a specific computer. You therefor need to make sure that you create the registration request from the computer you want to register. The registration request can be emailed from another computer but it must be created from the computer you want to upgrade to the full edition. If you want to upgrade, click 'Yes' when asked in one of the ROBOTILL applications. If you want to renew a licence that will soon expire, open ROBOTILL Manager on the computer you want to register and click on Help > Registration. Select the licence type. See 'Different licence types and what you get' at the bottom of this page. Check the box to confirm that the computer you want to register is the current one you are working on. You should only check the licence move box if you are replacing a computer and you need to move a licence from one computer to another. 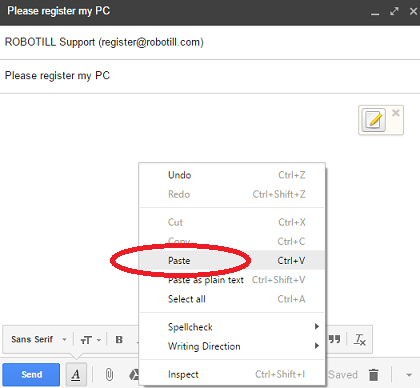 Note that you will not be allowed (and not be able) to use ROBOTILL on the original computer anymore if you choose this option. Click on 'Create Info' - the information will be copied to your clipboard. 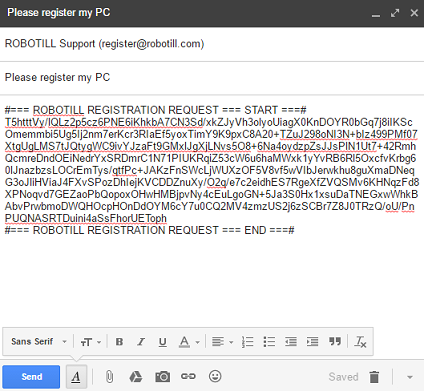 Compose an email to register@robotill.com and in the body of the email, right click and select paste. The needed information will be pasted into your email. No other information is needed, just click 'send'. You will normally receive your keys in an hour or two, but allow for up to 12 hours. You can close the registration application and continue to work in your free edition. You will not loose any data when you upgrade from the free edition to the full edition. 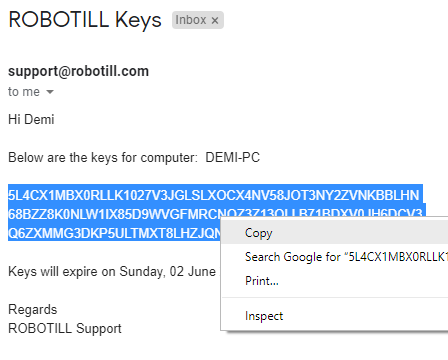 Once you receive your email from ROBOTILL with the keys open the registration app again. Depending on your licence type you will receive one to three keys. Select all the keys, right click and select 'Copy'. The keys will be pasted in the key box. You can then click on 'Register'. All the relevant applications on the computer will be registered. The result will be displayed in the key box. You can then close the registration application. If a ROBOTILL Application was open when you registered, you can just close it and open it again. Free Edition - You do not need to register the free edition. Simply click on 'No' when asked if you want to upgrade in one of the ROBOTILL Applications. If you need help logging in click on the help button in the log in screen. POS Computer (Till) - You will need to purchase a licence for this computer. You will get the ROBOTILL Manager, ROBOTILL Retail and ROBOTILL Restaurant keys. You will also be able to use Workhop Module on the same or another computer. Back Office Computer - If your 'back office' computer is the same as your till computer, then you do not need to send a separate back office registration as you will also get the key for ROBOTILL Manager when you register your till. If you want to register a separate computer as your back office computer, then you can use this option. You will need to have purchased a POS licence for another computer and you will only get the Manager key for this computer. Head Office PC for Managing Branches - This type of licence is optional and only needed if you want to perform 'head office tasks' for multiple shops/branches from a head office. You will get a key for the Branch Module and ROBOTILL Manager for this computer. You will need to have more than one shop with at least one POS licence per store and you will need to have purchased an additional Branch Module licence. Workshop Computer - You do not need to register a computer where you will use the Workshop module. You will however need to have one POS licence for that or another computer in order to use the workshop module. Legacy POS Licence - ROBOTILL used to have licences that does not expire. This option is only needed if you want to re-register a computer that has a lifetime licence and the keys no longer work. Note that ROBOTILL does not allow you to register a different computer with that licence.